Mobile is here to stay. Many of you are already taking advantage of mobile, but are you taking full advantage of all the opportunities out there? 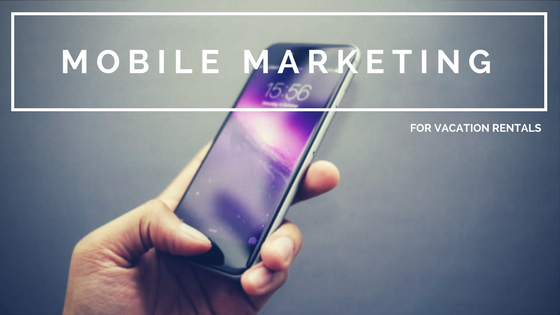 There are many opportunities when it comes to mobile marketing. As a vacation rental manager you should be taking advantage of these 5 mobile marketing opportunities. They will help you better promote your vacation rental. Responsive Website. If you don’t use responsive web design it’s going to be hard for potential customers to look at your website on mobile devices. Over 50% of travel reservations are made online. This number continues to grow with the prevalence of smart devices. Travel Apps. People prefer travel apps or mobile sites that help improve their travel experience. According to an article on Forbes, people prefer mobile services in the form of apps or mobile sites that allow you to avoid lines or give you local insight. Therefore, making your site not only about your vacation rental but how you can make your guests’ experiences better is a great strategy. Email. Email should definitely be on your list of mobile marketing opportunities for your vacation rental. It is an effective way to inform people of the promotions that you have coming up. Also it is a tool for keeping those who have opted to receive email up-to-date on your blog, events, and other news you may have. This can be used to nurture leads as well as delight those who have already stayed with you. Video. Video is predicted to make up about 82% of all consumer internet traffic by 2020. Therefore, the goal of video is to attract the right people and add value to them. Video can be used to give a tour of a rental. This will give them a better feel for what to expect. Using video to show different hot spots in the area can also entice people to book with you because you are knowledgeable about things to do. The possibilities with video are enormous when you sprinkle in a little imagination. Social Media. Social media is a great opportunity for your vacation rental. It is a place to show and share what your rentals are all about. Social media is also a tool to delight former guests and entice them to come back. Using fan photos are a way to show the the real aspects of your vacation rental. If your fans are posting photos others will see that people are honestly having a good time. It just proves that what you are promising is true. Keep in mind everyone’s mobile strategy will be different. Therefore, you could say one-size does not fit all. You have to create your own mobile strategy based on what works for you and what your guests want. However, with that being said the above opportunities should not be merely skipped because you don’t know how to use them. If applied correctly they can each be customized for your vacation rental and bring an increase in growth and engagement. If your mobile strategy could use a boost, we can help! Schedule your free consultation today to discuss solutions for you and your vacation rental.